Thursday marks five years since the date of the last time Congress raised the federal minimum wage to a paltry $7.25 an hour. 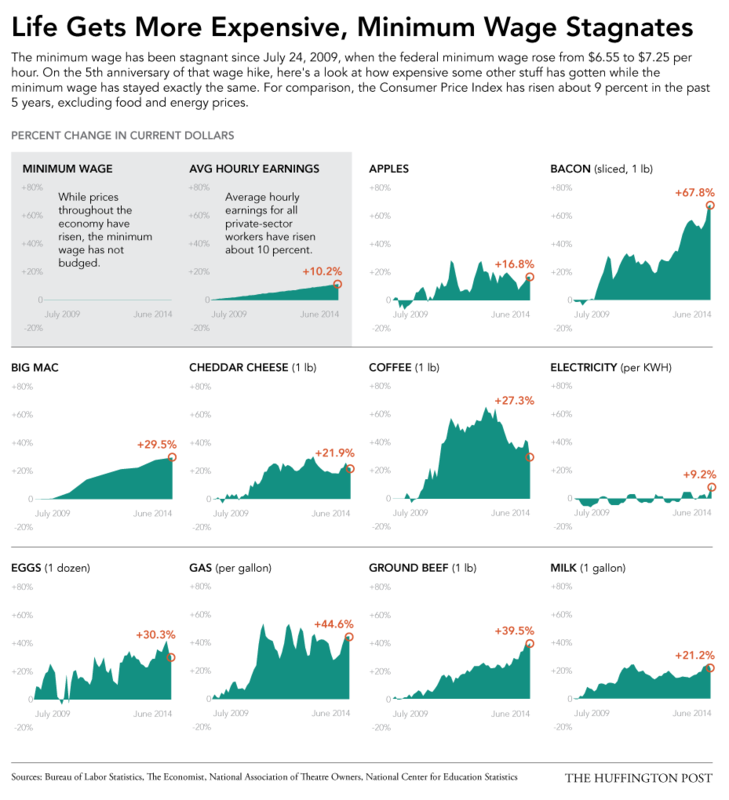 Since that time, the minimum wage has stayed flat, while the cost of living has marched steadily higher. The Labor Department's Consumer Price Index has gained nearly 9 percent during that time, excluding volatile food and energy prices. In some cases, food and energy prices have jumped even more: Beef and gasoline, for example, are up 40 and 45 percent, respectively, since July 2009. The average hourly earnings of private-sector employees have risen by roughly 10 percent during that time, just barely keeping up with inflation. But many low-wage Americans have missed out on even that modest raise: Roughly 1.5 million Americans made the federal minimum wage in 2013, according to the Labor Department, and many made only slightly more. A full-time, minimum wage employee will only make $15,080 per year. To put that in perspective, the federal poverty line for a family of four is $23,850. It's no wonder that labor advocates refer to these low wages as "poverty wages."